Whilst in America last year I discovered so many different foods I really loved. To me, their supermarkets were fascinating and full of so many things we don't have here; pop tarts, eggs [I know we have those but theirs are kept in the fridge! 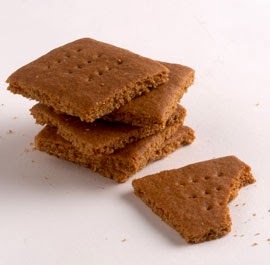 ], so many cereals, individually wrapped sticks of butter... and.... graham crackers. My new favourite biscuit. If you haven't had the pleasure of trying them before they are a wholemeal honey flavoured biscuit not overly sweet but not savoury either. They are often used as the bases for cheesecakes or to make smores. Delicious. I got a New York Cookbook over the weekend and to my delight there was a recipe for making them at home [plus lots of other delicious ideas like a peanut butter smoothie, I can guarantee I'll be putting plenty of recipes up in the coming months!]. Beat the butter and sugar in an electric mixer until light and creamy. In a separate bowl, whisk together the egg, honey and milk. In a third bowl, combine the baking powder, salt and flour. Now add the egg mixture to the butter mixture alternatively with the dry ingredients until you have a smooth dough. Form the dough into a bowl and cover loosely with glad wrap. Refrigerate for an hour and a half. Preheat your oven to 180C and divide the dough into two balls. On a lined baking tray, roll out one ball so it's nice and thin, about 2mm thick. Using a pastry knife, score the rolled out dough into 16 rectangles of the same size. 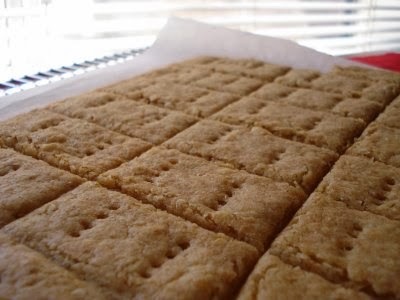 And then using the tip of the knife make the lines of little holes on the biscuits (this is what makes graham crackers recognisable). Bake for about 15 minutes or until the biscuits are golden and crispy. As soon as they're out of the oven separate them with your knife following the marks you made before cooking. Allow to cool on a rack. Repeat with your second ball of dough.